Saturday was an opportunity to look around not just Leigh Archives, but also the parish church. David Lawton, the verger, was kind enough to give me a conducted tour of some of the areas with a particular connection to the Tyldesleys. In the north wall of the church is a brass plaque commemorating Sir Thomas Tyldesley 1612-1651. This dates back to the 1870s when the church other than the tower was rebuilt. 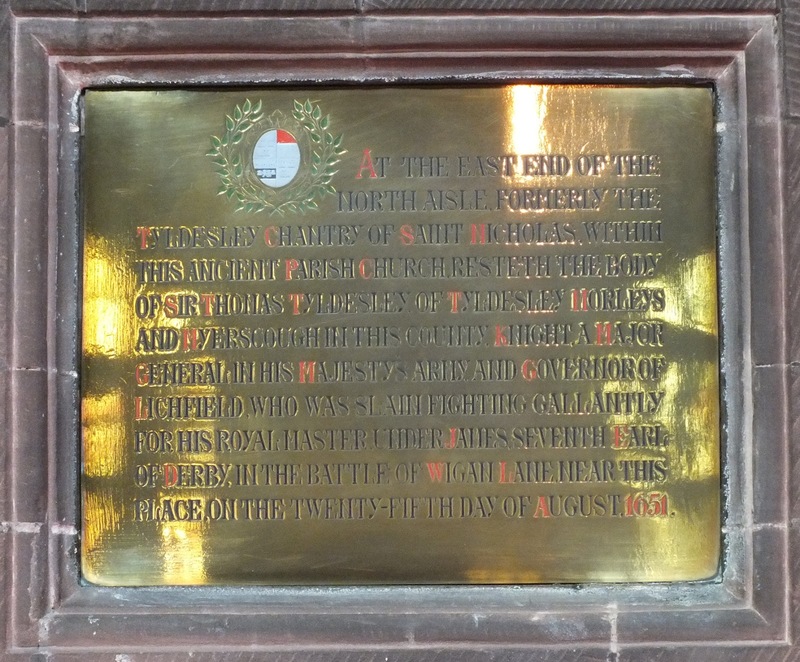 At the east end of the north aisle, formerly the Tyldesley chantry of St Nicholas, within this ancient parish church, resteth the body of Sir Thomas Tyldesley of Tyldesley Morleys and Myerscough in this county, Knight, a Major General in His Majesty's army, and Governor of Lichfield, who was slain fighting gallantly for his Royal Master under James, Seventh Earl of Derby, in the battle of Wigan Lane near this place, on the twenty-fifth day of August, 1651.